The Paper Mario series has long followed an odd trajectory, filling in the holes left in the wake of new trends on Nintendo consoles. The original N64 title and its GameCube sequel worked to satiate both fans of 2D Mario games and fans of turn-based RPGs, who both felt a bit left behind on those two consoles. If you hated polygon-based Mario and his adventures, and/or felt lost and alone after Square stopped publishing the numbered Final Fantasy games on Nintendo consoles, you could always turn to Paper Mario to try and get those needs met. 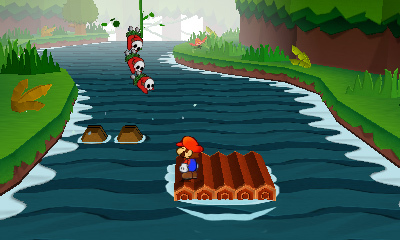 On the Wii, Paper Mario went even further towards the original Mario titles, which as history would show, had a ravenous audience that was starving for more. Super Paper Mario ditched the turn-based combat for a gameplay formula that felt by and large like a traditional 2D platformer, albeit with four playable characters, an experience point system, and the ability to explore the X, Y, and Z axis for a limited time (and all with minimal use of motion controls). 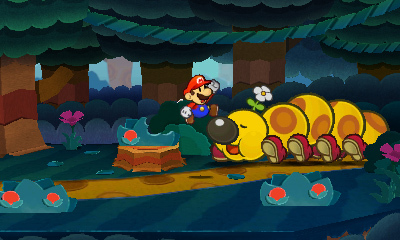 Once again, the Paper Mario series was willing to move in the opposite direction that the majority of Nintendo was headed, while still doing its fair share of new things along the way. 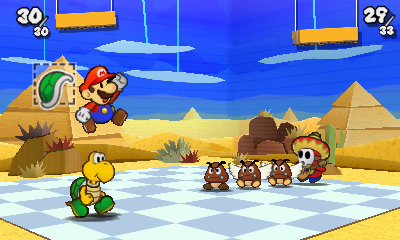 Now that the New Super Mario Bros. series have taken back the reigns of 2D Mario proper, Paper Mario: Sticker Star has been left without a default direction. Thankfully, that's allowed the series to return back to a style of that Nintendo has been less and less fond of in recent years. The game ditches many of the RPG tropes associated with the series, while bravely asking the player to work for every ounce of success they achieve. Sticker Star refuses to hold your hand. That might make some Paper Mario fans feel uncomfortable, but will surely please naysayers who have called out Nintendo for going soft in their middle age. Sticker Star has just as much in common with Super Mario World and the original Legend of Zelda as it does the other Paper Mario titles. Like Super Mario World, the game is divided up in a large overworld map, divided by "worlds" and "levels." Most stages can be completed in the "obvious" way, but the deeper you get into it, the more secondary objectives and secrets pop up. Like The Legend of Zelda, the game allows for a lot of non-linear exploration, encouraging the player to explore every inch of every level. Jumping into the unknown, smashing every wall you see with a giant hammer, and scanning every inch of the screen for clues is the only way you'll get through this game. You even have to find hidden "container hearts" to increase your max HP. While the trappings here are definitely Mario, the feel is just as much classic Zelda as anything else. 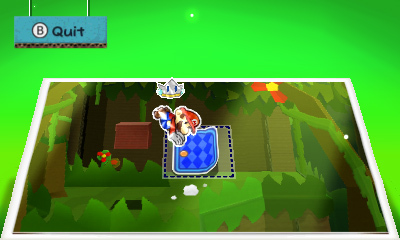 While Sticker Star reaches farther back into the Nintendo lunch box than many other 3DS titles, it also drops many of the tools utilized in prior Paper Mario games. There is no experience point collecting, no multiple party members to organize, and not much of a story. Things start off with the introduction of and alien sticker thing that crash lands in the Paper-Mushroom Kingdom. 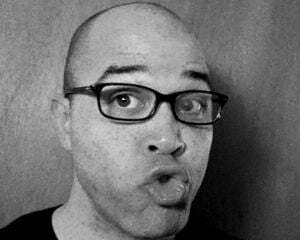 A radical sticker fest is disrupted, a giant turtle man is transformed into a super glossy, rainbow sticker, and panic ensues. From there, Mario meets and his new sticker-fairy pal Kersti, and has to engage in a fairly bland in-game tutorial warm up. After that, the story sort of fades into the background, only popping up in short burst of charming and relatively uneventful dialogue. Kersti's most important role in the action is to introduce Mario to Sticker Star's central gameplay hook -- the collection and utilization of stickers. You use stickers for just about everything in this game, from combat, to healing, to solving puzzles. Every attack you perform in the game costs you a sticker, which makes stickers a precious commodity. Thankfully, stickers are everywhere; attached to walls, hidden in "?" blocks, on defeated enemies, and anywhere else you can imagine. Knowing that, a new and potentially lifesaving sticker gives the game a constant feeling of potential promise. Animal Crossing and Monster Hunter fans know what I'm talking about. You'll need to have a wide variety of stickers on your person at all times, and with over 100+ stickers in total, there is a lot to keep straight. It's easy to remember what as you'll need to custom-fit your attack methods to the enemies at hand in or in order to survive. There are stickers that represent just about every type of attack ever seen in the Super Mario series, from familiar moves like jump attacks, hammer strikes, and fire flowers, to weirder stuff like ice flowers, frog suits, and Dry Bones'... bones. There are also loads of new variations on those themes, like hammers that crumple enemies or put them to sleep, or jump boots that allow you to stomp on multiple enemies at a once, or even light them on fire. 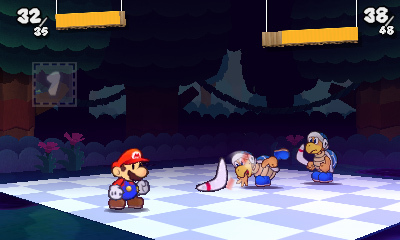 Like in prior Paper Mario games, you still play an active part in each battle. If you press the action button during an attack or defense animation at the right time, you can hit a lot harder and take a lot less damage. Still, the outcome of each combat scenario is largely determined by the stickers. It doesn't matter how good your reflexes are. If you continually try to stomp on a turtle covered in spikes, or swing a hammer at a flying mushroom man, you're going to end up in tears. Some enemies, like the Ninja (first seen in Super Mario Bros. 2), can actually change up their styles depending on their mood, requiring you to attack them with either overhead or head-on attacks as indicated by their behavior. All this leads to a constant game of resource management and mid-battle strategics. That balance can also be found in the environmental puzzles. The same stickers you use in fights can be used to unlock new areas, defuse traps, and otherwise allow you to move forward. 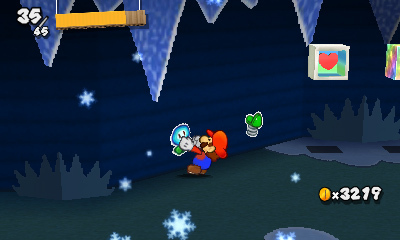 In a step that reverses the "gimmick" of Super Paper Mario, Sticker Star allows you to "Paperize" the world at any time. This flattens the immediate area and allows you to search for secret spots in the environment where stickers can be attached. You can't get away with sticking just any sticker, though. Many of these puzzles require use of the rare stickers that you acquire by discovering real, three-dimensional objects (like soda cans, pool balls, goats, and jack hammers) and later turning them into stickers. These stickers double as the game's "summon" magic, and are the key to most of the game's bigger sticker-based puzzles. The addition of bland, real-life objects feels delightfully surreal when placed amid the backdrop of this world of felt and paper. It only works to make these stickers feel more special, and make it more tense when you risk using one in battle or to solve a puzzle. Other than the addition of non-paper objects, the game's visuals don't do anything too new for the series, but they still look fantastic, especially in 3D. The effect adds just enough pop to make the potentially flat world seem like a diorama come to life. When the game "paperizes," the shift from 3D to 2D is even more dramatic. The 3D also helps to help you space out your jumps and place the exact location of objects, both important aspects to navigating a 3D semi-platformer. As nice as the graphics are, the music is probably the standout when it comes to surface level treats. It's completely fantastic, packed with funk bass, '20's blues horns, humble accordion, jazzy piano, and all manner of percussion and miscellaneous instruments. The battle music is particularly catchy. I've had it in my head for days. It all does wonders to help to help the sometimes tired environments feel more stimulating. Which brings us to the less than exciting parts of Sticker Star. While the game offers a fresh take on game design, the environments and storyline are mostly variations of things we've seen from prior Mario titles. There are a few new standout characters (like Sniffet and Wiffet), but you'll also be spending a lot of time bickering with Kamek, Bowser Jr., and the occasional Wiggler. Combat can also get a little tired. There is less incentive to fight here than in prior Paper Mario titles, as there is no semblance of an experience point system to speak of. You can collect valuable stickers from certain enemies, and all battles yield at least a few coins, which can be used to give you more attacks per turn, and purchase --you guessed it -- more stickers. The problem is, sort of like in New Super Mario Bros. 2, you'll likely collect all the coins you'll ever need without having to try too hard. While the promise of new, undiscovered stickers laying out in the wild is always there, the coins feel a bit superfluous and don't offer much of a feeling of reward. Thankfully, battles aren't random, so you'll always have a fair chance at escaping a fight before it starts. It's relatively easy to run through familiar areas unscathed if you've gotten to know your surroundings. You can also smash weaker enemies into instant death before combat even starts once you've reached certain benchmarks. The developers seemed well aware that exploring the same (often humongous) areas and fighting the same enemies may get a little painful, so they provided the player with many alternate routes and potential escape plans to keep things from growing stale. Overall, it's fans of the first two Paper Mario games that may end up being the most disappointed with Sticker Star. If you wanted a big story, a large group of side characters, and traditional "attack, magic, item" turn-based RPG combat, you may be sad to see that Sticker Star has none of the above. Instead, you get a resource collection/management, action/exploration game that left me running from enemies and conserving "ammo" in the way I used to in Resident Evil 1-3, while exploring a big, secret-filled world in the traditional Nintendo style. In fact, I'm guessing that game may be a little too hard for some who started in on Nintendo consoles in the hand-holding, 64-bit days. Though it looks like something that might run on the GameCube or the Wii, Sticker Star plays a lot more like something from the 8- or 16-bit era than most recent Nintendo adventure titles, which is a large part of why it's one of my new favorite 3DS games.